It’s only six months now until the start of the Global Wind Summit in Hamburg, the biggest and most important meeting of the wind industry worldwide. It combines the world’s leading wind industry expo WindEnergy Hamburg with the global conference of WindEurope to create a high-powered, unique platform for business, networking and information for the onshore and offshore wind industry. These two top events, the expo and the conference, will be held side by side from 25 to 28 September 2018 at the Hamburg Messe site. Exhibitors, visitors and conference participants are expected from some 100 countries. The 9 exhibition halls of the leading wind industry expo WindEnergy Hamburg are already almost fully booked, which means about 1,400 exhibitors and some 35,000 trade visitors will be there in September. In addition to these three major areas, the exhibitors at the world’s leading wind industry expo explicitly cover all the thematic areas of this innovative industry. That applies both to technology and to the major wind markets around the world. More than 20 national pavilions with representatives from very different countries and regions present their wind energy expertise. The national flags on the pavilions range from China to South Korea and the United States to a whole series of European countries. The Danish stand occupies the most space, that is the whole of Hall B1 (ground floor). Trade visitors and delegations from all continents are expected in Hamburg. The stands at the fair are a great place for trade visitors to meet specialised companies that cover all the major products and services in the value chain – turbines and rotor blades, electric components, logistics, safety equipment, finance and insurance, innovative materials and smart energy. Visitors can take the “Storage Tour”, which guides them to exhibitors with solutions for the storage of renewable energy, distributed in various halls around the expo. The specific requirements for offshore applications are covered in a number of halls, for example companies with special-purpose ships, and suppliers of components and services from the maritime sector. Start-ups will have their own section at the world’s leading wind energy expo. That includes for example the stand for “Young Innovative Businesses”, which has funding from the German Ministry of Economics and Energy (BMWi). WindEnergy Hamburg also gives international start-ups dedicated to innovations in the smart energy sector opportunities for speed-dating, to help them make contact with global partners. Another opportunity to find new business partners is the Enterprise Europe Network (EEN), which invites all exhibitors and visitors at WindEnergy Hamburg to a B2B Matchmaking Event, that is WindEnergyMatch 2018 on 27 and 28 September. The Global Wind Summit will be held in Hamburg, the capital of the wind industry, from 25 to 28 September 2018. 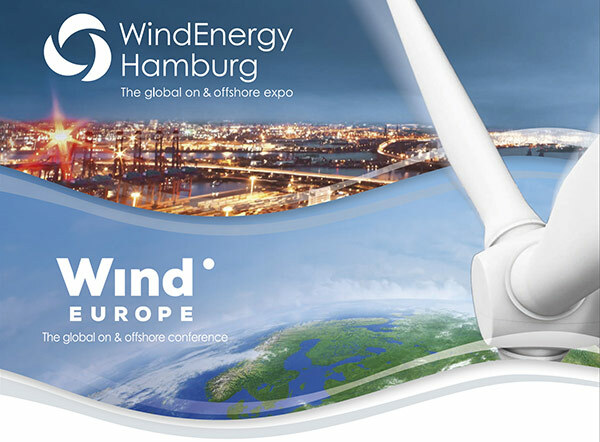 It comprises WindEnergy Hamburg, the world’s leading wind industry expo for the onshore and offshore markets, with some 1,400 exhibitors presenting their product innovations and projects and covering the whole of the value chain. In parallel, the Global Onshore and Offshore Conference will be held by WindEurope in the halls of Hamburg Messe. HUSUM Wind will be held from 10 to 13 September 2019, focusing on the most important core market of the industry – the German wind energy market, which is the technology leader. More than 650 exhibitors of the onshore and offshore wind industry will present their key products and innovations. This traditional meeting point, held every two years in the middle of the trailblazing wind region on the German North Sea coast, is ideal for intensive exchanges between the industry experts, generating added value for practical application.